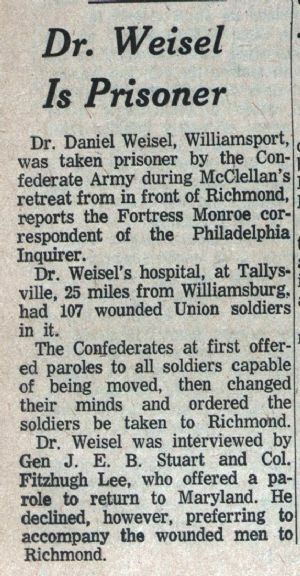 Dr. Daniel Weisel, Williamsport, was taken prisoner by the Confederate Army during McClellan’s retreat from in front of Richmond, reports the Fortress Monroe correspondent of the Philadelphia Inquirer. Dr. Weisel’s hospital, at Tallysville, 25 miles from Williamsburg, had 107 wounded Union soldiers in it. The Confederates at first offered paroles to all soldiers capable of being moved, then changed their minds and ordered the soldiers be taken to Richmond. Dr. Weisel was interviewed by Gen J. E. B. Stuart and Col. Fitzhugh Lee, who offered a parole to return to Maryland. He declined, however, preferring to accompany the wounded men to Richmond.